Here are simple charts showing Australian teeth numbers. These are the numbers that dentists and doctors use to identify adult teeth. Check out the diagrams of teeth numbers Australia below! Check left and right and match it to the markings on the tooth chart. Please note that everyone has all the molar teeth. This is because many people have had their wisdom teeth extracted (18, 28, 38, 48). Kids teeth are numbered differently in Australia. See the diagram below to see what Aussie dentists use to identify kids teeth. Double check whether it is on the left or right! Sometimes both adult teeth and kids teeth will be present in the mouth at the same time. This can mean the tooth numbers from both charts are mixed together. I put together a post that explains the two different systems that dentists use all around the world to number teeth. It’s worth a read check it out here! Most countries the world uses the same numbers as Australia. If you have questions about Australian teeth numbers you can post a comment below! The dental quote for one of my boys says the 4D and the 3D need fillings what does that mean? Hi Jan, are you in Australia? Referring to baby teeth as letters is another tooth numbering system less commonly used. 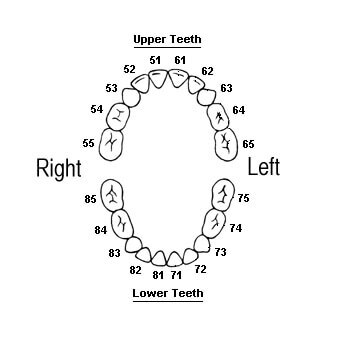 So for your son the 3D = tooth 73 and the 4D = tooth 84 on the baby teeth chart above.